Designing a couples invitation suite and all of the custom little details for the wedding day is always truly an honor, but when collaborating with a best friend for her big day makes it extra special! 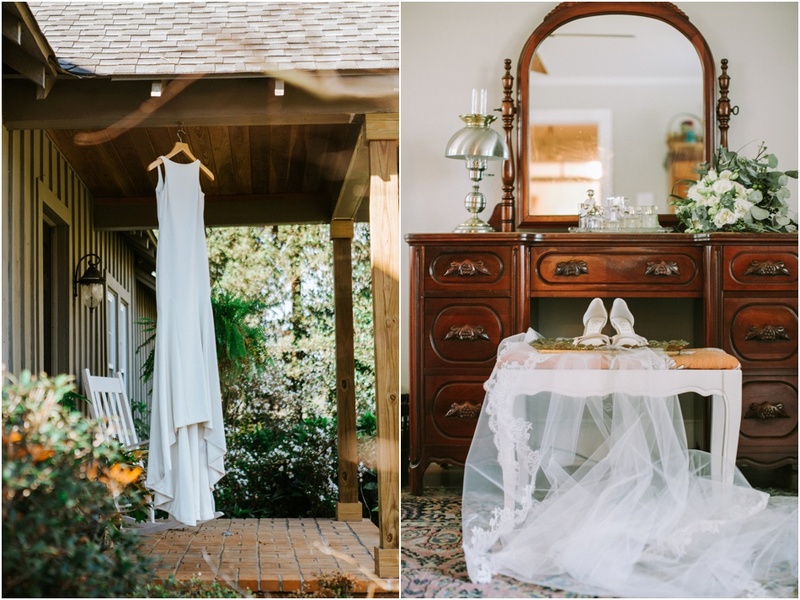 Meg and Brian exchanged vows and danced the night away on the evening of February 25, 2017 in Magnolia Springs surrounded by their closest friends and family. Knowing Meg and Brian's personality and style I knew I wanted to design a classic, elegant invitation suite with a hint of whimsical touches. To tie in Meg's love for antique treasures from her grandparents, I incorporated gold foil accents and an intricately designed wedding monogram. After seeing the navy bridesmaids dresses chosen for their February wedding, I knew a deep navy envelope would make the perfect final touch to wow their guests. It created a gorgeous contrast from the bright white paper and the handwritten gold calligraphy that graced the envelopes. The invitation design was 5.5x8.5 (A9) and foil printed on a heavy weight cotton paper. The details card was 4.5x4.5 printed on the same paper using a dark navy letterpress ink. For an extra soft, romantic touch, a blush hand-made silk ribbon was used to tie the cards together so that they would stay stacked nicely inside of the envelope. 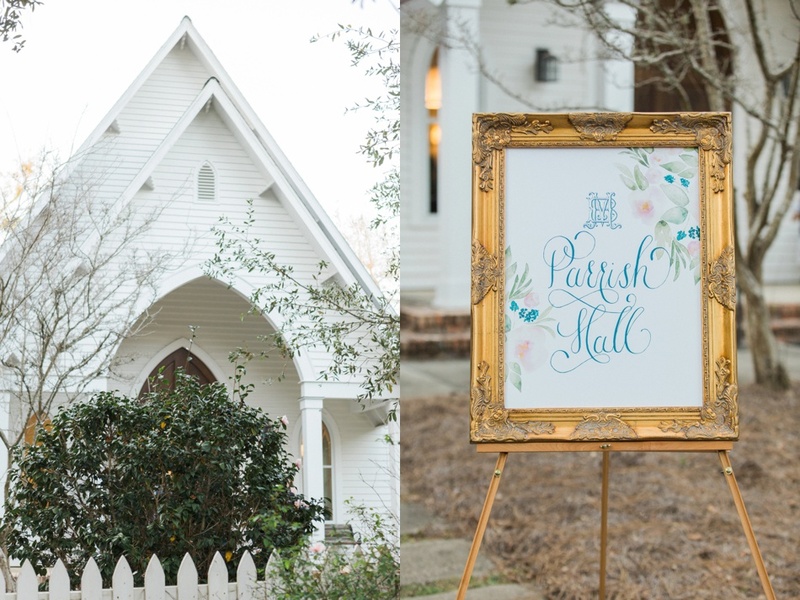 To tie the wedding program in with their invitation suite, I included navy lettering, custom hand painted watercolor florals and a charming illustration of the Chapel where Meg and Brian exchanged their vows. A soft, hand-made silk ribbon was also tied on the programs. The custom designed details did not stop with the invitation suite. 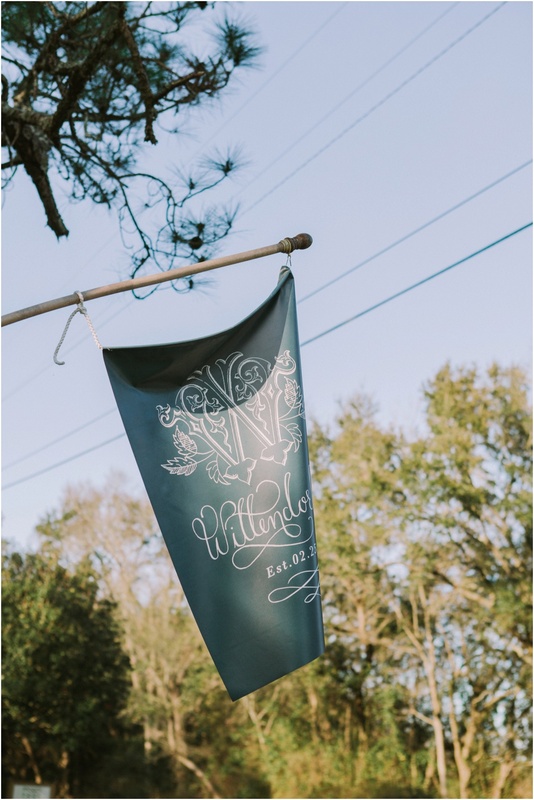 Throughout the ceremony and reception, there were several signs including, navy and gold beverage and food signs, a welcome sign, direction sign and a little sign for the guests gifts from the bride and groom! To thank the groomsmen for being a part of their wedding celebration, we had custom Tervis Tumblers made with their wedding logo. This was of course a hit, along with the gold foil napkins and frosted beverage cups.